Personalized DNA sequencing is the next major milestone in medicine. Already, doctors have begun fully sequencing patients genomes to evaluate genetic risks. Nanopore based DNA-sequencing offers, in principle, a low-cost alternative to current DNA sequencing methods with real time read-out of the DNA sequence as an electric field drives the DNA through the nanopore. To identify the base inside the nanopore, DNA's movement through the pore must be precisely controlled. Control over interactions with biomolecules holds the key to applications of graphene in biotechnology. One such application is nanopore sequencing, where a DNA molecule is electrophoretically driven through a graphene nanopore. Here we investigate how interactions of single-stranded DNA and a graphene membrane can be controlled by electrically biasing the membrane. 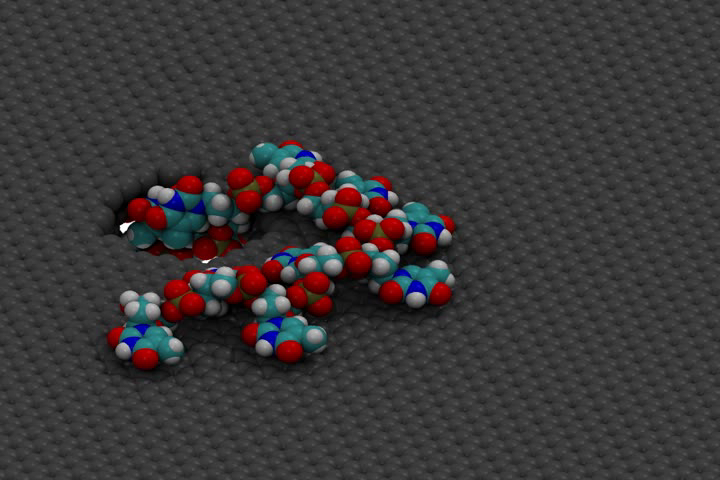 The results of our molecular dynamics simulations suggest that electric charge on graphene can force a DNA homopolymer to adopt a range of strikingly different conformations. The conformational response is sensitive to even very subtle nucleotide modifications, such as DNA methylation. The speed of DNA motion through a graphene nanopore is strongly affected by the graphene charge: a positive charge accelerates the motion, whereas a negative charge arrests it. 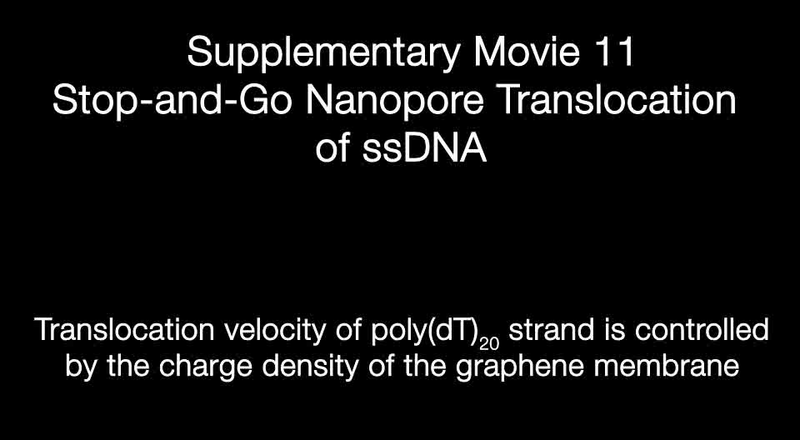 As a possible application of the effect, we demonstrate stop-and-go transport of DNA controlled by the charge of graphene. 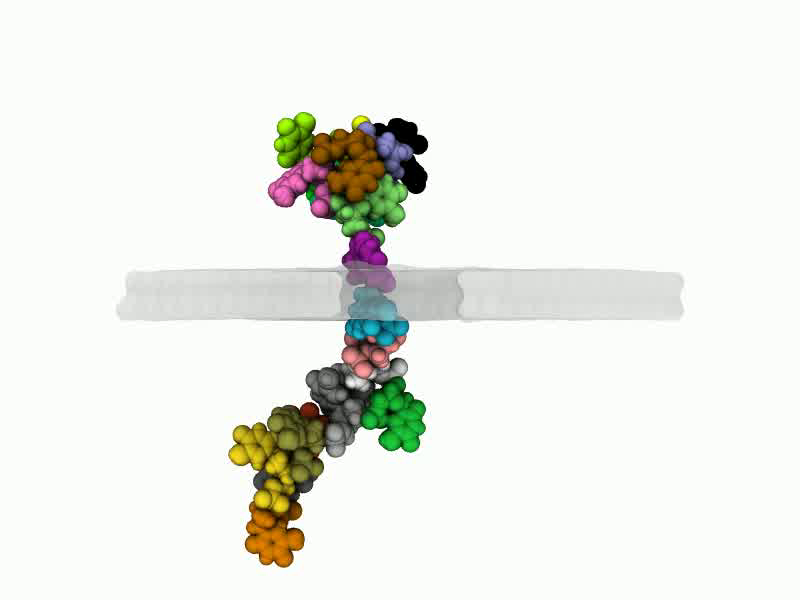 Such on-demand transport of DNA is essential for realizing nanopore sequencing. Single-stranded DNA (ssDNA), poly(dT)20, is inside the nanopore embedded in a graphene membrane (grey). The nucleotides of the ssDNA on the outside of the nanopore are adsorbed to the graphene membrane. The adsorbed strand laterally diffues across the graphene membrane. 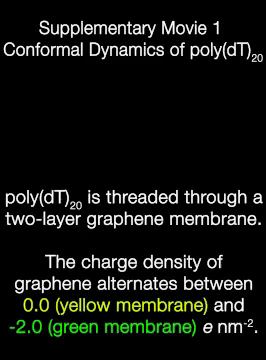 Typical conformation of a poly(dT)20 strand near a two-layer graphene membrane charged at −2.0 e nm−2. Charge is modulated between 0.0 e nm−2 (yellow) and −2.0 e nm−2 (green). Single-stranded DNA (ssDNA) unbinds from the negativly charged graphene membrane and is adsorbed to the neutral membrane. 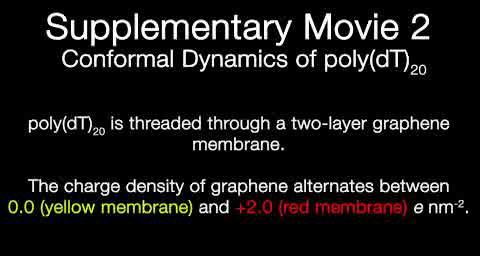 Charge on the two-layer graphene membrane is modulated between 0.0 e nm−2 and +2.0 e nm−2. When the membrane is positivly charged, the bases of ssDNA are tilted with respect to the membrane; only a fraction of the base atoms make direct contacts with the membrane. The phosphate group of the backbone is bound to the surface of graphene. Poly(dG)20 inside a nanopore on a -2.0 e nm-2 charged membrane. The amine group on the guanine base is in contact with the surface of the graphene membrane while the negativly charged backbone is repelled from the membrane. Poly(dT)20 inside a -2.0 e nm-2 two-layer graphene membrane. An 500mV transmembrane potential is applied to drive ssDNA through the membrane. Interaction between the DNA bases and the nanopore embedded inside the negatively charged graphene prevent translocation under the driving potential. Stop-and-go transport of a poly(dT)20 strand through a nanopore in a 3-layer graphene membrane. The presence of a ±500 mV transmembrane bias is schematically indicated by the color of the background. The motion of ssDNA strand is controlled by the charge of the graphene membrane: the motion is facilitated at +1.5 e nm-2 (red) and arrested at −1.5 e nm-2 (green). The DNA is shown using vdW spheres colored according to the nucleotide number. The movie illustrates 860 ns of a continuous MD trajectory. The MD trajectory is paused during each membrane charge adjustment; the actual time scale of the charge adjustment is 0.2 ns.